WINCHESTER, Ind. — A Greenville man being held in the Randolph County (Indiana) Jail escaped from custody early Monday morning. Robert Dean Lewis, 26, was working as a jail trustee, cleaning the lobby of the jail around 3:20 a.m. When the jail officer went to gather trash from the restroom, Lewis ran out the front doors. He was seen on surveillance video captured Lewis heading south from the jail wearing a yellow jail jumpsuit with “trustee” on the back. Lewis is 5 feet, 6 inches tall and weighs 185 pounds. He has brown hair and brown eyes. Lewis was arrested Oct. 15, 2014, and was incarcerated on charges of burglary of a dwelling and theft of more than $50,000. 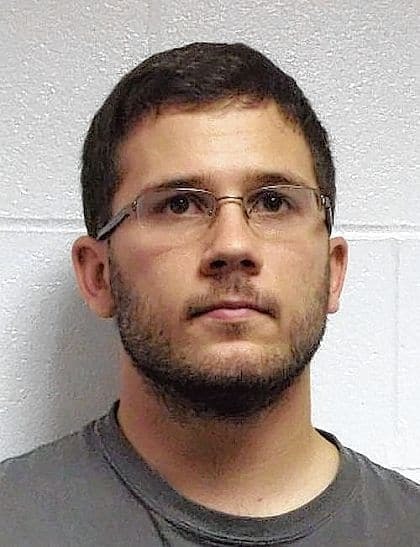 Lewis was arrested at his residence in Union City, Ohio, along with his girlfriend Briana Lane Hawley in connection with a burglary. Charlie Shaw, owner of the Winchester Speedway, reported the proceeds from the Labor Day race weekend were stolen from his residence. Reported stolen was about $60,000 in cash and an additional $20,000 in checks. Hawley had been a volunteer trophy girl at the speedway, and Lewis worked at another company owned by Shaw. Investigators executing a search warrant found the couple had spent about $35,000 in cash on various items during the two-week span following the Labor Day race. The Sheriff’s Department had no additional information about Lewis’ whereabouts as of Monday afternoon, according to a dispatcher.